According to the analysis of Big Data of Girlgroup Individual Brands in January 2019, Black Pink’s Jennie was ranked No.1, followed by GFriend’s Sowon and GFriend’s SinB. In order to analyze girl groups’ individual brand name, the Korea Enterprise Institute analyzed 111,810,359 big data of 432 girl group members from December 17, 2018 to January 18, 2019. No.1 Black Pink‘s Jennie Brand has a brand rating of 4,420,723. Compared to the brand rating of 3,520,709 in December of 2018, its brand rating increased by 25.56%. Black Pink’s Jennie Brand, which ranked No. 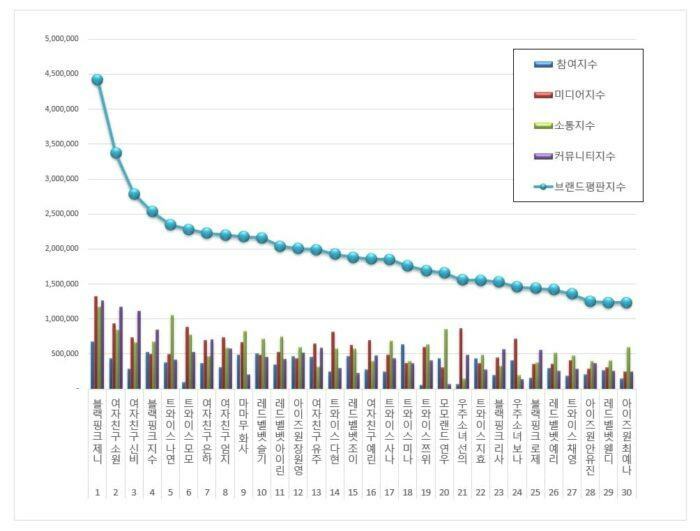 1 in the individual brand name of girl groups in January 2019, had high levels of ‘love, flustered, heartache‘ in the link analysis, and ‘Golden Disc, Kai, and dating‘ in the keyword analysis. The second-ranked GFriend’s Sowon‘s brand rating was 3,372,251. SinB’s brand, which ranks third in the rankings, is rated 2,789,036.